The Great Ouse flows north-east for about 140 miles through the counties of Buckinghamshire, Bedfordshire and Cambridgeshire, eventually flowing into the Wash near King’s Lynn. It flows in a meandering course around the village of Felmersham in Bedfordshire, where these photographs were taken (1). Walking along the river leading up the bridge at Felmersham, the banks looked particularly attractive in mid May with the trees all sporting their new outfits in various shades of green. 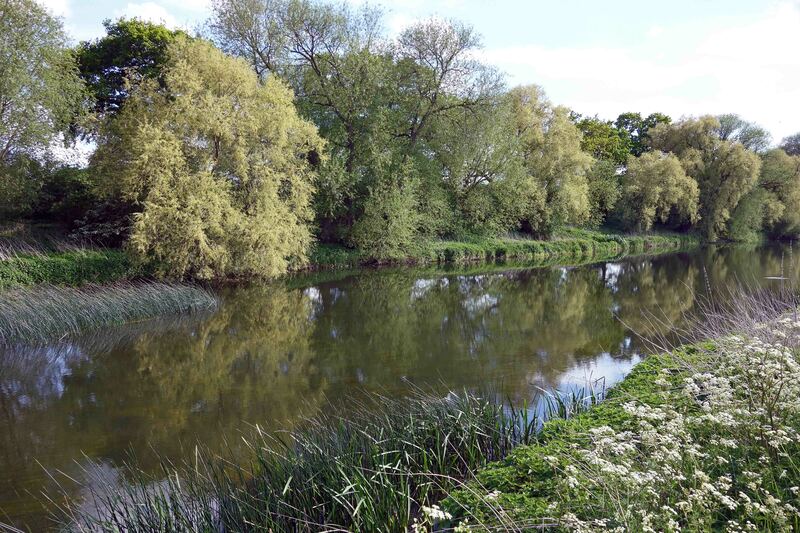 River bank of the Great Ouse, near Felmersham, Beds, on 13th May 2015. There was also a lot of insect life to be seen along the river bank. 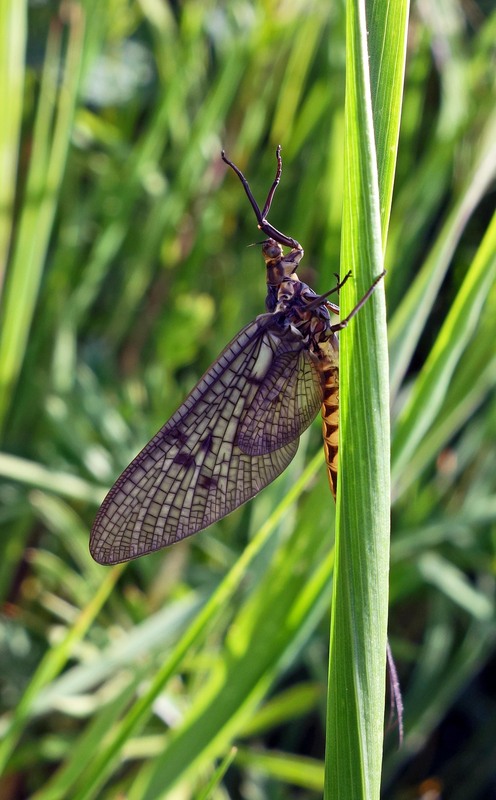 Mayflies were in abundance, and were flying even in the middle of the day. There were lots resting on foliage, having no doubt just hauled themselves out of the river. After one or two years as larvae, feeding in the mud at the bottom of the river, they have just a few short hours (24 hours max) to meet and find a mate, before they die. Don’t ask me how many fail to find a mate! It’s a cruel world and if there was a kindly God they would all find a mate and live happily ever after in their rocking chairs in Mayfly never-never land! The males dance in swarms above the water trying to attract females to fly into the swarm and mate. The males grab the females with their long front legs and the pair mate whilst in flight. 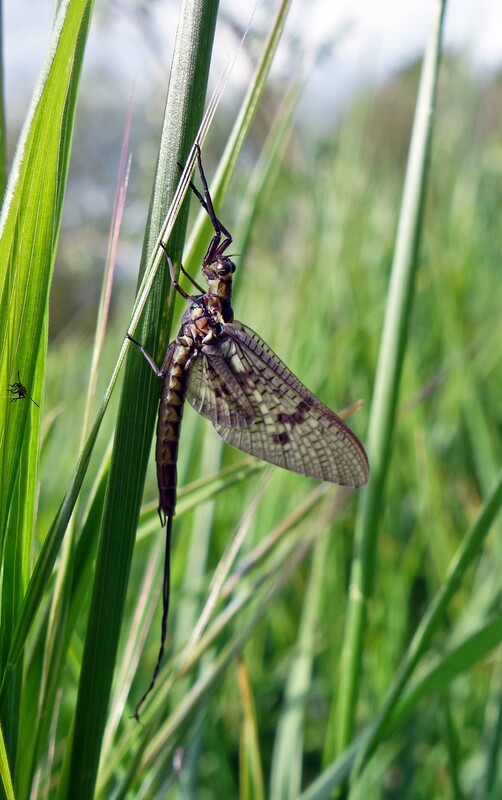 The females then fly down to lay their eggs on the surface of the water, before falling onto the water, spent and motionless, food for fish (2). The males fly off to die on the land apparently. Anyway, for a brief moment, they get to dance in the sun and I love the way they fly up and float down, almost as if they were attached to a yo-yo! Difficult to photograph them doing this though. 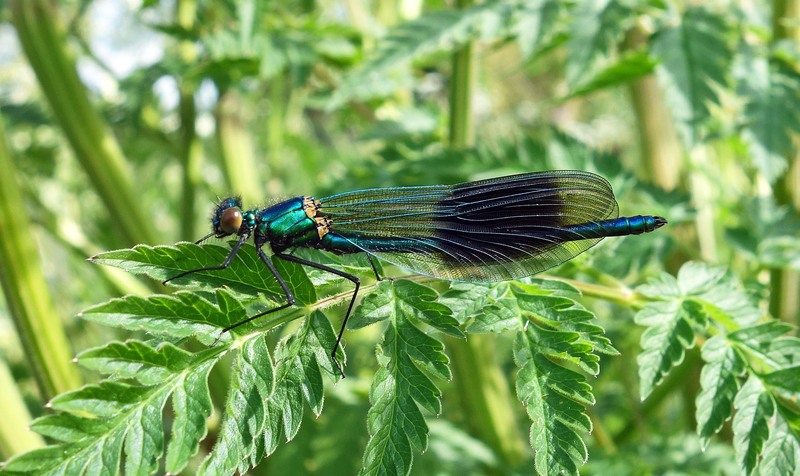 The were also lots of damselflies along the banks of the Great Ouse, particularly the Banded demoiselle (Calopteryx splendens), with the showy males appearing very striking with their dark iridescent, blue-black spots. This species is sexually dimorphic – meaning the sexes look quite different – and the wings spots are a ‘sexual character’, a bit like antlers in male red deer. Wing spots vary in size, but it is thought that the females may choose to mate with males with large and showy wing spots (3). 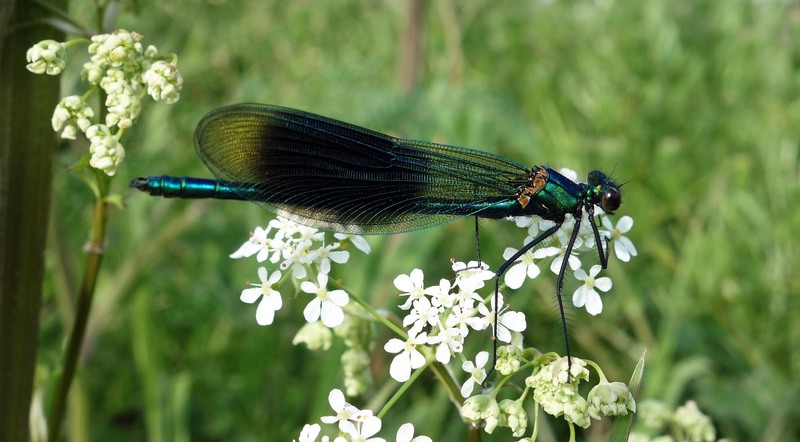 The males with large wing spots might do well with the females however, but it seems that they are also more prone get into fights with another damselfly species, the Beautiful demoiselle (Calopteryx virgo)! So they are very attractive to the lady damselflies, but their increased attractiveness means that they can’t hold onto a high quality territory, because they are so flashy they bring out the aggressiveness of the other species! (3). What do you want girls? A fancy man or a nice home? Sorry, I could not resist anthropomorphising! It’s called a trade-off. As the great evolutionary biologist W D (Bill) Hamilton hypothesised, the intensity of colouration of features such as these wing spots (or feathers in birds) can be a true and reliable indication of male fitness. And it turns out that wing spot colouration is indeed ‘correlated with male disease resistance and immunological condition’ in this species (4), so the females are actually being quite canny in choosing the best males to mate with, based on these wing spots. The spots are also highly visible and rather mesmerizing in flight and the males display in front of the females in an aerial dance. It’s Nature’s way of ensuring the best genes flow into the next generation, but it’s hard on those guys who can’t dance! There has been an enormous amount of research carried out on this, and related species. Just drop Calopteryx splendens into Google Scholar and take a look! 3. Rantala, Markus J., et al. 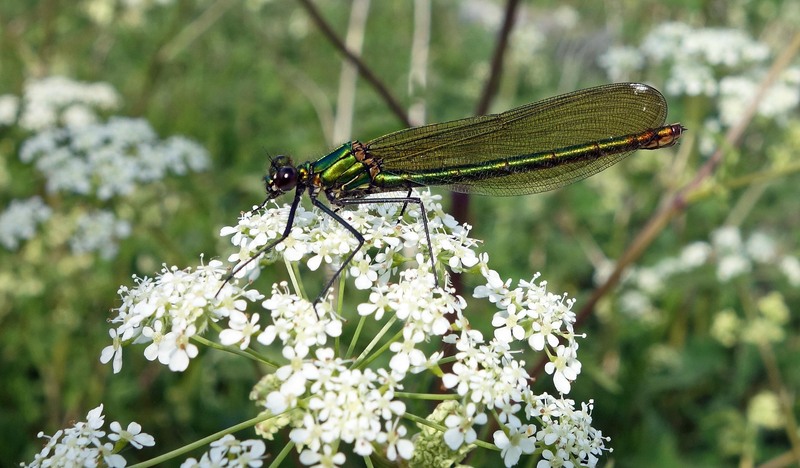 “Immunocompetence, developmental stability and wingspot size in the damselfly Calopteryx splendens L.” Proceedings of the Royal Society of London. Series B: Biological Sciences 267.1460 (2000): 2453-2457. 4. Svensson, E. I., et al. “Molecular population divergence and sexual selection on morphology in the banded demoiselle (Calopteryx splendens).” Heredity 93.5 (2004): 423-433. Fascinating post and beautiful images. I appreciate your references – I’ll have to have a look at Google Scholar. 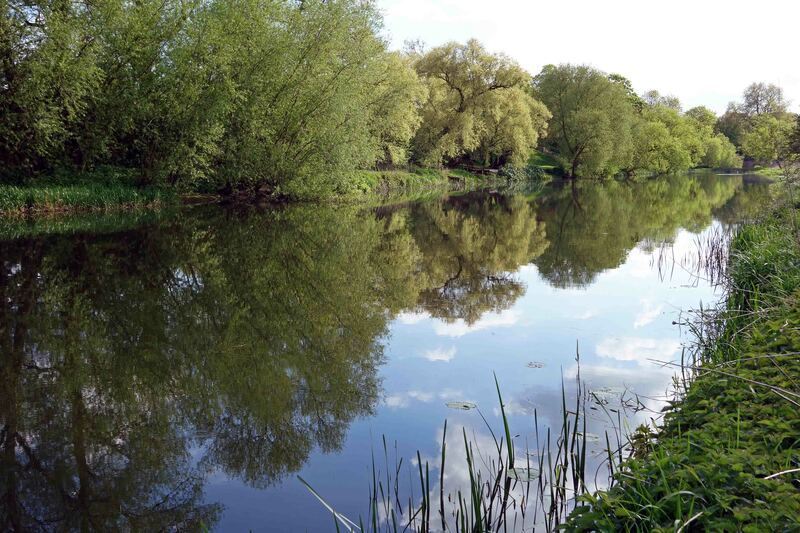 (Ditto to the previous comment) The river photos look like something out of Wind in the Willows, a beautiful location! Yes, all that is needed is a water rat!